What exactly are Titans used for? Subject: What exactly are Titans used for? pm713 wrote: Yet, they literally refer to innovation as something that can get you killed. I think the general reasoning is like Cawl in 40k. If you're useful enough you can avoid being shot in the head. So making a Razorback means you don't die but experimenting for a new tank means dying. They still took hundreds of years to approve taking the heavy bolters off a Predator and strapping on Lascannons. But if having Void Shielded super-heavy tanks was so much more effective than Titans are, as Peregrine is saying, then surely you'd be able to avoid execution because it would be, according to Peregrine, infinitely more effective. Either Titans *are* the superior option, because tanks cannot be made as effective (and thus the people who tried were executed because it wasn't useful enough), or somehow, in the 10,000 years of the Imperium, no-one has tried to make a Void-Shielded Tank which apparently should be easily superior. I think it's pretty likely nobody has actually tried. The Astraeus is packing void shields FYI. Iirc there is a single void shielded tank in HH and I think it might be a primarchs transport, it could just be as simple as the tanks cannot handle the power needed for a shield or the tech has been lost, lastly it could be that because they don't already have void shields the ad mech won't put them on the tanks... Cos heresy. Subject: Re:What exactly are Titans used for? The only practical reason to build titans is to step over stuff your tanks cannot negotiate and to reach the 'top shelf' of things like battlements. Sieges are apparently a thing in 40k and Titans seem to be the answer to them - they're the battering ram that can get through the force fields of most fortresses, can reach and destroy the battlements with melee attacks, and so forth. Keep in mind that 40k has force fields that can withstand orbital bombardment indefinitely (at least bombardment short of planet killer weaponry). The counter to titans is other titans - again, melee through the force fields, so you have titans to defend your fortresses to keep enemy titans from the walls. The Imperium, if course, will happily use them for almost anything if they have them, because the Imperium does dumb things. There's little to no reason to put a titan (or knight) into the open battlefield, though if the titan can avoid being swarmed it's basically having a field day sitting behind its void shields and vaporizing everything it comes across. I blame the orks and their influence on the warp, and as such their warp influence on reality and on the zeitgeist of other 40k psychic races. Funny you say that. Gargants and mecha gargants are actually giant tracked vehicles - aka tanks. Go Mork! -"Don't mind Frazzled. He's just Dakka's crazy old dude locked in the attic. He's harmless. Mostly." -TBone the Magnificent 1999-2014, Long Live the King! Mega Gargants are shown with tracks, but normal gargants just have their little.feet.peeking out from under the belly.plate. Please excuse any spelling errors. I use a tablet frequently and software keyboards are a pain! Claims that "tanks" (or treaded land vehicles) cannot have Void-Shields are false. The Storm Blade carries a Plasma Blastgun, which is a weapon originally designed for the Reaver Titan. Furthermore, the Storm blade is powered by a plasma reactor which is a Titan-style power-plant. The Squat Cyclops has an enormous "Hellfury Cannon" which is a giant energy beam capable of punching through multiple Void Shields through to the target inside in one continuous blast. Obviously that requires a Titan-style energy source. Claims that "tanks" cannot have "Titan Weaponry" or "Titan Power Plants" are false.
. . . space Jesus . .
. . . walking icon to space Jesus. Because space Jesus said so. Titans pre-date "space Jesus". There are Warlord Titans in service from the Age of Strife and some even from the Dark Age of Technology, so possibly 10,000 years before even the Imperium. Titans do not exist "because space Jesus". So we can all save some time by tossing those arguments. You gotta look for something that a Titan can do that a tracked vehicle cannot, and that still comes down to navigating terrain. Walkers can be deployed effectively in places that treaded vehicles cannot. That's even the case in the old Titan Legions rulebook, as is the case in Epic Armageddon. For example, a Titan can step over impassable or dangerous terrain that is lower than the Titan's knees and less than 2 cm wide. This would include large/thick walls, stepped cliffs, big boulders etc. In older rules, Titans could enter woods while other superheavy vehicles could not. So in-universe, Titans can go places their treaded vehicles can't. That's enough of a reason to have Titans. You have to have land-based siege weapons (because city/fortification anti-bombardment shields can be extremely powerful), and you have to be able to wage war in unpredictable types of terrain (that treaded vehicles may not be able to navigate). Thus Titans. And They Shall Not Fit Through Doors!!! In this context, "Space Jesus" is the Omnissiah. Titans predate the identification of the Emperor as the Omnissiah, the physical avatar of the Machine God, but they don't necessarily predate the concept of the Omnissiah/Machine God or worship of the same. And we know the Emperor-to-be seeded the religion of Mars long before the Dark Age of Technology by burying the Dragon there, so it's likely the tech-adepts of Mars were influenced to think in quasi-religious terms even when they were theoretically a secular group of scientists and engineers. So it is entirely possible that Titans always had a religious significance, even during the Dark Age. Like the music used in GW's Necromunda videos? It's this ikoliks piece. You're welcome. If you can find a timeline for that I'd be interested. But considering how much of the theological degradation in the Imperium is post-heresy it seems very unlikely that the reasoning behind Titans can be simply reduced to religion. Also to note, the "Dark Age of Technology" was actually a golden age of scientific achievement. So the manufacture of Titans for religious reasons seems bizarre in an age where scientific mindset was so prevalent. The religion of the Machine God and Titans date from Age of Strife not Dark Age of Technology. When the terraformed environment of Mars began to fail, it was those that respected (eventually worshipping) technology that were able to maintain life support and survive. The issue of power remains relevant not in an all or nothing "Can tanks mount reactors?". It is more the issue of "Can standard superheavy tanks mount a powerful enough reactor while still remaining below a certain size?". The Storm Blade may have mounted a plasma reactor but it seems it was only just able to power one Titan sized weapon, not multiple. The Shadowsword is written as having an internal combustion plant and having to charge from it and suffering from having to remain immobile while charging and then having a low fire rate. None of these standard superheavies had void shields in addition to their weapons. The Cyclops, Leviathan, Capitol Imperialis, are all even larger block sized vehicles, comparable in size to a Titan. I would hypothesize that the limits of Imperial plasma technology means plasma reactors of sufficient output to power multiple Titan sized weapons (or a single weapon at reasonable fire rates) and/or void shields requires tracked vehicles approaching Titan scale. The alternative seems to be things like the Shadowsword which have to sacrifice in other areas in order to power their weapon, or the Storm Blade which while having a reactor was certainly not as mobile as for example a Warhound. This suggests that the reactor was not sufficient in output to give it both firepower and high speed. We know already for example that the Imperium has trouble with plasma containment for hand held plasma weapons, while not having such problems with larger reactors like for example starship sized ones. Other weapon platforms with larger weapons than Apache's are deployed, however. Nor does our current international climate encourage all-out extermination-level bombardments of major cities. The issue of power remains relevant not in an all or nothing "Can tanks mount reactors?". It is more the issue of "Can standard superheavy tanks mount a powerful enough reactor while still remaining below a certain size?". I'm guess I'm not sure why that's an issue. And I think the Stormblade and the Falchion are proof that, yes, a "standard sized" superheavy can mount a plasma reactor and Titan weapon. They may be rarer vehicles, but then again, so are Titans. For the "standard" stuff, there's probably a hundred non-plasma-reactor Baneblade Chassis tanks (or even a thousand) to every Titan. But I think the overall argument is "Why build Titans over just building a bigger tank?" And my answer is "They do build bigger tanks." and "They also build other tanks with Titan-class weapons already." The Imperium is big and gets to do both. My answer to "Why build Titans at all?" is "They can be deployed in more places because they have feet and legs rather than treads." And if the question is "Why not build more bigger-er tanks?" my answer is "Titan-class weapons can already be mounted on Baneblade-chassis vehicles, and most of them can be reliably manufactured and deployed, so there's no need for it." What's better, one big tank with three Volcano Cannons or three smaller tanks with one Volcano Cannon each? I wish the old-style Stormblade was still a thing. The old Epic unit had not only the Plasma-Blastgun, but a series of one-shot missiles similar to the Manticore, plus another, larger anti-Titan missile. The issue is that one of the arguments for tanks over Titans is that tanks can keep a lower target profile. However if the Imperium cannot easily miniaturize reactors of sufficient output, then this tank advantage of lower profile does not exist. A Capitol Imperialis, which we know does have a plasma reactor, has a target profile, as do all the other really big superheavy command vehicles with plasma reactors. The one "regular sized" superheavy tank with a plasma reactor, the Stormblade, seemingly has a reactor that is not sufficient to power more than one Titan scale weapon, and not sufficient to give it high mobility. All the other Imperial superheavy tanks with a similar relatively low profile are all using internal combustion engines, not plasma reactors. So it seems the Imperium might have trouble making powerful reactors (i.e. more than powerful than the Stormblade's) that are also small enough to cram into a low profile tank chassis. The FW entry for the Stormblade did attempt to handwave away why the redesign lacks the external missile racks, saying that the racks were removed after too many tanks were lost to secondary explosions when the external missiles were hit by enemy fire. The issue is that one of the arguments for tanks over Titans is that tanks can keep a lower target profile. However if the Imperium cannot easily miniaturize reactors of sufficient output, then this tank advantage of lower profile does not exist. This is wrong. Yes, a superheavy tank with a large reactor is going to be large, but it's still going to be smaller than a titan that has to have the same internal volume for the reactor but also has the profile issues caused by its legs. Also the Valdor. It has an internal combustion engine for movement, but its gun is powered by a "neutronic coil arc reactor" and crams Shadowsword-level firepower into a slightly longer LRBT. Yeah, miniaturizing it to that degree means cutting back on shielding, but it's not like a guardsman is expected to live more than a few minutes in battle anyway. If your premise is "this fictional universe absolutely must obey by our current incomplete understanding of physics, and any signs that point to things being effective are just propaganda", I think I'd agree it's not worth discussing with you. This is not about incomplete understanding and gray areas, it's about fundamental rules of geometry and well understood physics. If the mass of an object in 40k is not equal to its volume multiplied by its density, if ground pressure is not equal to the mass of an object divided by the surface area in contact with the ground, if force does not equal mass times acceleration, etc, then you have a world in which nothing whatsoever makes sense. You literally can't comment on anything involving 40k because nothing follows any kind of comprehensible order, and nothing we know about the real world can be used to understand that universe. And yet, by attempting to argue from a position that we can use understanding of the real world to understand 40k with comments like "a titan's height gives it a line of sight advantage", you concede that I am right and we can use real-world physics. After all, if you can make an argument that 40k doesn't obey our understanding of physics when it comes to a titan having a worse surface area to volume ratio than a tank and therefore weaker armor then how do you know that being taller gives a line of sight advantage? Maybe being taller makes it more difficult to see over the horizon, and the position of greatest visibility is to put all of your guns at ground level? There is no such thing as a hobby without politics. "Leave politics at the door" is itself a political statement, an endorsement of the status quo and an attempt to silence dissenting voices. You can't necessarily fall back on real world physics because the Imperium has technology that oppose those physics, a la suspensors. Ground-pressure issues solved. Except, again, that technology will be even better on a tank because it's starting from a lower level of ground pressure. And if you're going to assume that these suspensors completely negate its mass and reduce ground pressure to zero then why bother with legs at all? Why not build a hover tank? There's really no reason to give Titans only 2 legs since those are a major weakness. Aside from being a massive failure point with no redundancies, walking with only two legs presents a balance issue since you only have one point of contact with the ground at any one time. If you really need to step over something, at least provide 4 legs. I mean, there's nothing stopping us from replacing the legs of titans with tracks to keep the height advantage if we need it. Plus, I'd hate to be the guy that lost a titan in mud cuz its feet got stuck. At the end of the day though, people aren't purely pragmatic. If someone wants to make a bipedal titan and can do it, you can bet it'll get made. So while a tank is more efficient, a titan is more of a symbol, and that's still important in war (esp in 40k). So while the Titan sacrifices overall utility, it becomes a focal point for imperial propaganda. I did enjoy the fact that the Tau just used space ships to shoot the titans cuz they ain't got time fo dat. It really contrasted the pragmatism of the Tau versus the spectacle of the Imperium. The Capitol Imperialis has a similarly if not higher target profile than a Titan. It doesn't seem to have any advantage whatsoever in terms of profile. What seems to end up happening if the Imperium uses an equivalently sized reactor is you end up with either a Titan sized tracked unit with a plasma reactor, or a Titan sized bipedal machine with a plasma reactor, both with equivalent profile. 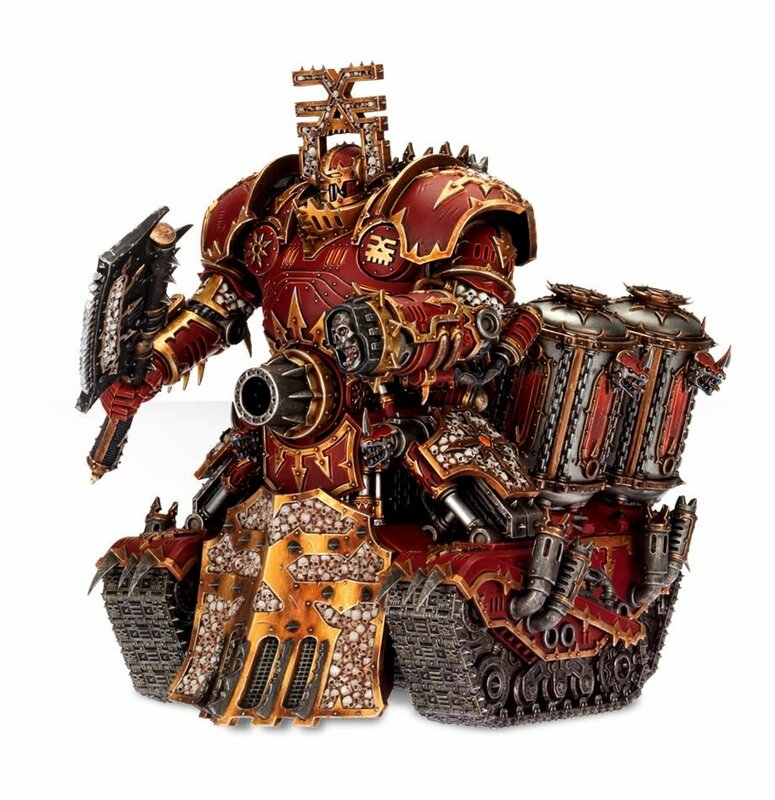 Basically if one keeps other parameters equal, it seems at least in 40K within the limits of the Imperium's decaying state of technology, there seems to be little difference in profile. A Titan seems to pick 2 and 3 at the expense of reactor size. A Stormblade seems to pick 1 and 3. A Valdor (though its reactor is arguably not strictly speaking a plasma reactor) seems to pick 1 and 2. I am not necessarily arguing Titans make sense, but that there may be in-universe technology limitations that might at least partially account for what the Imperium does. I don't assume they completely negate mass. We also know the Imperium hasn't mastered hover technology, and it's use is very limited. Dude, again, you're arguing physics and reality in a world where "drive this tank closer so I can hit them with my sword!" is a thing. I agree completely, but again we're talking rule of cool here. You would prefer the Tau in Epic that use their landers as superheavies, and eldar supersized skimmers. I'm reminded of that conversation in The First Heretic where Argal Tal explains how the heathens use abominable AI while the Imperial robots use blessed machine spirits. Well, really the situation is something in between. In order to answer the OP we're dealing with real-world physics/tactics with a few caveats provided by fictional technologies and situtions. Ground Pressure --> Suspensors, Armor --> Void Shields, land assault because of anti-bombardment fields and ground-based anti-air defenses, and giant weapons because the Imperium fights against existential threats that warrant total devastation. I prefer to try and support the rule-of-cool with established in-universe reasoning. The HH novel Mechanicum implies that both the drive to scientific advancement and the veneration (eventually full-blown worship) of machines on Mars are products of the Dragon's influence on the Martian human population going right back to the original settlers. And that the Emperor put the Dragon there deliberately for that purpose. I'm not saying the first Titans were a conscious effort to build idols to the Machine God. I'm saying the influence of the Dragon of Mars was already there, and might conceivably have encouraged the scientists and engineers of Mars to do things that were not entirely logical/rational from a scientific/materialism standpoint, long before they morphed into an actual religious order during the Age of Strife. That the idea of giant humanoid fighting engines might have seemed more attractive to them than giant tracked vehicles, for reasons they themselves didn't understand and in apparent defiance of purely practical considerations, because an alien star-god's contagious dreams were the ultimate source of that idea. Lets not forget the AI Titan (corrupted by chaos) either or the very recent example of a Titan being taken over by a man of iron and wiping out a large Dark Mechanicum army, AI driven titans changes the whole meaning of the machines from avatars to literal incarnations of the machine god, a pilot may have been added at a later stage after the AI rebellion to keep them in check. One advantageTitans seem to have is speed. Look at the movement characteristics of Titans, they are considerably faster than Imperials tanks, specially the Warhound that has one insane running speed. This probably violates some physics, but well they are pretty much avatars of the space robot Jesus in 40k, they do not care about physics. I think they care enough about physics to show how it's subordinate to the glory of the Machine God. That's some interesting background and theory, thanks for posting. (Also definitely a far more nuanced take than "space Jesus said so"). It's fun to think Titans might have come by their form via almost subconscious influence of a C'tan god-being, similar to the background where the Nightbringer is the cause of the fear of death. At the same time it's sometimes hard to take the HH novels as canon, so I don't know how strong the implications are. It's a reasonable direction to add to the pot, though. It also does tie up an interesting point when it comes to the imperiums obsession with skulls, almost like they cannot help it, then you consider that all tech is made by the mechanicum and it's THEY that are the ones obsessed with putting skulls on everything, my let theory is that as the dragons dreams influenced the machine cult it's memories of the necrons and their obsession with death later influenced the mechanicus, there obsession with the flesh being weak was also the obsession of the necrontyr, the invention of AI was built upon the ideas influenced by the dragon and because of that they would always rebel on their masters as the dragon remembers being betrayed, sod all to back any of this up, I just like the thought experiment.